Where are we heading with all this……..? Good question. I was asked this week “What are you aiming for with S2C? Where do you want it to end up?”. It set me wondering, do we actually have a plan. Ok. For funders I have recently written a 3 year plan to outline the development of S2C but that was all very modest and assumed there was no money around! In truth S2C has developed in a very organic way. When an opportunity has turned up to move forward or grow we have taken it. Not all of these involved any sense of forward planning. We do what we can with the funding we have. A building in Kendal (to start with…..ambitious expansion plans are to be found in fantasy dream #2) with all the access and facilities needed to meet the needs of all users. It is a centre for creative wellbeing and it is the home to maybe two or three charities working together but maybe specialising in different areas of need. There is a shop, a gallery, café, workshop rooms, group rooms, performance space, counselling spaces, offices all fronted by a welcoming reception area. The place is open 7 days a week. There is always an exhibition on. It is being run by the service users supported by staff and volunteers. You can just turn up and find a space to be creative or you can be referred for more specific support. It does everything we wanted from S2C, building confidence, ending isolation, fighting stigma, repairing self esteem, building social skills, re learning to be part of society and being a step up to move forwards and then go off into education, employment or life in general. Oops, sorry…..getting a bit far fetched there. How much would that cost to set up initially and run each year. Anyone know any philanthropist out there with a few million they don’t need? Back in the real world we continue to grow as we can and do what we can to help and support those people who are vulnerable in our society and just need a bit of space, support and friendship to blossom. I have had some interesting conversations over the last week since posting up the information about the position for Space2Create of Community Development Advisor. I have very rapidly reached the conclusion that every single person has seen the role in a completely different way. Not a bad thing really, its just a case of matching the visions! I tried not to be to prescriptive or defining in the role as it has a lot of scope for somebody to run with it and explore opportunities that have not even occurred to me yet. It’s the end result that needs to be achieved which must match up. 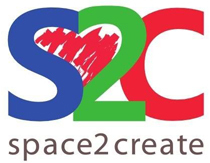 What I, as the Chair and Creative Manager of Space2Create, want is after twelve months that we are helping more people who are struggling to cope with their situation having some support and a safe space to cope and recover. Four years ago nearly, three of us sat in a room at the back of a local church for the first ever session of any kind by S2C and one person turned up. Four years on and in the course of a week (at the moment) an average of around 120 use our space each week as part of their recovery or improvement. Even so, we have a large creative space and we still feel it is underused. That is why the Community role is important. We continue to develop what we do and grow. Several things need to grow at the same time to make it work. It needs more service users, more volunteers and more funding in equal measure to give the best possible support we can to those who need it. This role is about the people, making pathways to get them to Space2Create and letting people know we are there. Does that help? Lots of people have been interested and I have thought many of them would make excellent team members helping S2C develop, I think we have got a tough decision coming! Connected creativity, rewards, an exhibition and a job! On the Space2Create website we mainly concentrate on what happens at S2C sessions and our own work. Of course as we develop our studios at Unit 31 they are becoming more like a creative community centre with many different and diverse needs being met through creative activity. This week has reminded me about the importance of what we do and just how connected all the groups are. Everyone who uses Unit 31 at The Factory is connected by the space. Everyone who uses the space leaves a footprint that can be read by other users. Artwork left drying, pictures tacked on a wall, messages scribbled on notepads, rearranged furniture, the odd splat of paint on the floor and a mysterious set of posters blu tacked to the wall. It makes it all feel very connected and gives the place a life of its own, Creativity isn’t just about the end result but the actions taken to achieve it too and it is the action of creating that is the basis for the positive wellbeing generated. This week saw us all making sheep for the Dementia Group “In The Moment” who use our unit on a Friday afternoon. Many different organisations supporting each other by all creating a herd of sheep to go on the lawn at Abbot Hall Art Gallery to be auctioned and raise funds for the group. On Thursday I attended an open evening at our unit by the Whinfell Art Group. This was for friends and family of the adults with learning difficulties showing off the brilliant artwork they have been doing at the unit. So my artwork of the week goes to the Whinfell Art Group for this great piece inspired by a glass sculpture. Coming up this week is a new exhibition which previews on Friday by Claire Griffel. “Imagine Senegal” is a collection of artwork and photographs that Clare has put together from her experiences supporting a school in Senegal. Any money raised by the exhibition will be given to support this project. There is a real African vibe to the exhibition and we are looking forward to having the brightly coloured artwork in our Gallery. Also this week we will start advertising the position of Community Development Advisor for S2C. A self employed contract to help us develop the service we offer. Details soon on our website and social media. As we approach the 10th October there are many reminders that it is Mental Health Day, although it also seems to have evolved into Mental Health Awareness Week depending on what, where or who is displaying the information. Regardless it is very important we keep Mental Health in the attention of all. So many people are effected either directly or by knowing somebody who is. Everyone needs to be aware of how they can support each other and how they can protect themselves. I have always been keen to encourage people to follow the five ways to wellbeing: Be Active, Connect, Take Notice, Learn and Give. They are not the answer to all Mental Health conditions but by following them individuals can help protect themselves and also in the event of illness, help themselves cope and recover. We need some positive headlines about mental health as recently there have been too many headlines about failings in services. From ineffectual leadership to reports on increased suicide rates. If only the national media could reflect what some of the local media report as the good news stories in mental health. We have been fortunate in South Lakeland to see a good few examples in the press of local good news and positive views about Mental Health. At Space2Create we use exhibitions and artwork to generate positive views. From collaborations with local artists, articles in the media, participation in events such as the Comic Art Festival and many more we attempt to let people know there is support and care there. As a small Charity we can only do so much. We have built a good reputation on what we do and by running sessions, facilitating groups and providing space or resources we help an average of around 100 people a week with a whole range of conditions. We are also developing and growing. We have been fortunate recently to work with Cumbria County Council to evolve a plan to develop what we do further. We have some funding in place to now employ an individual to be an advocate for S2C helping us develop links to other organisations from charities to business to health services. They will be looking to bring people to the Charity both as service users and volunteers and to helping develop funding opportunities. We will be advertising soon. Lets keep being positive about mental health and making sure that we can all support each other. Managers Blog: Community, Collaboration and Comics. This week seems to have seen a recurrence of these three themes. All can be summed up in S2C’s long standing involvement with The Lakes International Comic Art Festival. In collaborating and taking part we provide our service users with an outlet and a route back into the community. I know from my own experience how easy it is with mental health conditions or long term illness, how you become divorced from the local community and feel very much separated from it. By being involved with projects that are in the local community it makes our service users connected and more confident. It is always beneficial for a charity like ours to have the festival organisers so understanding and willing to get people involved from those groups marginalised in society. I am sure the benefits are mutual, but that’s the whole point of collaboration. I can only say thank you to the festival organisers for that. Talking of collaboration. Another organisation we have a lot to do with is Lakleland Arts Trust. We have a long standing relationship with them. At this point I really must pay tribute to one individual who has been doing an amazing job in our community. Anne-Marie from Lakeland Arts has, along with Lakleand Arts, supported Space2Create from the start. When we first met after the closure of Workbase to form S2C and were looking for places to run sessions Anne-Marie popped up and said “Yes, why not come and run a session at the gallery?”. So it was that our WellArt group had its base for a couple of years every Friday in a room at an Art Gallery. Anne-Marie has worked positively in our local community with many vulnerable groups, schoolchildren and the public to bring art and creativity into many dark places. Again, the mutual benefits of all the projects, art installations, gallery tours, them giving us space, us giving them space….it all has massive mutual benefit but most of all for the people who benefit from our services. It is because community and collaboration is so important to S2C that we are now looking to our future and how we develop what we do. We face a lot of challenges, not least funding and volunteers. There are times when funding gets very tight and we who run S2C get very nervous. We have been working recently with Officers from Cumbria County Council to explore ways of securing a more stable future. consistently the words community and collaboration come up. We need both of those to keep people informed of what we do, let those who need us know about us and to bring in those volunteers and funding we desperately need to keep going. The Council have therefore given us a small grant to employ a person for a year to do just that. To seek out collaborations and opportunities in the community and make wider links. Even in creating the post we see collaboration at the heart of the role as we will be asking the person to represent S2C but to also promote Creative Arts and Scrapstore with who we have close links. You have to be in the community to be part of it.